I’ve always enjoyed fabric. My mother was a seamstress by trade, and I can remember she used an old sewing machine while sitting at the kitchen table, and created all of my clothes and school uniforms. I’ve had a sewing machine since we first got married and could afford one. I also worked part time for a couple of years at a fabric store when I was a stay-at-home Mom while my daughter was in grade school. My sewing skills are moderate, but it doesn’t keep me from being drawn to those who are skilled in creating with fabric. 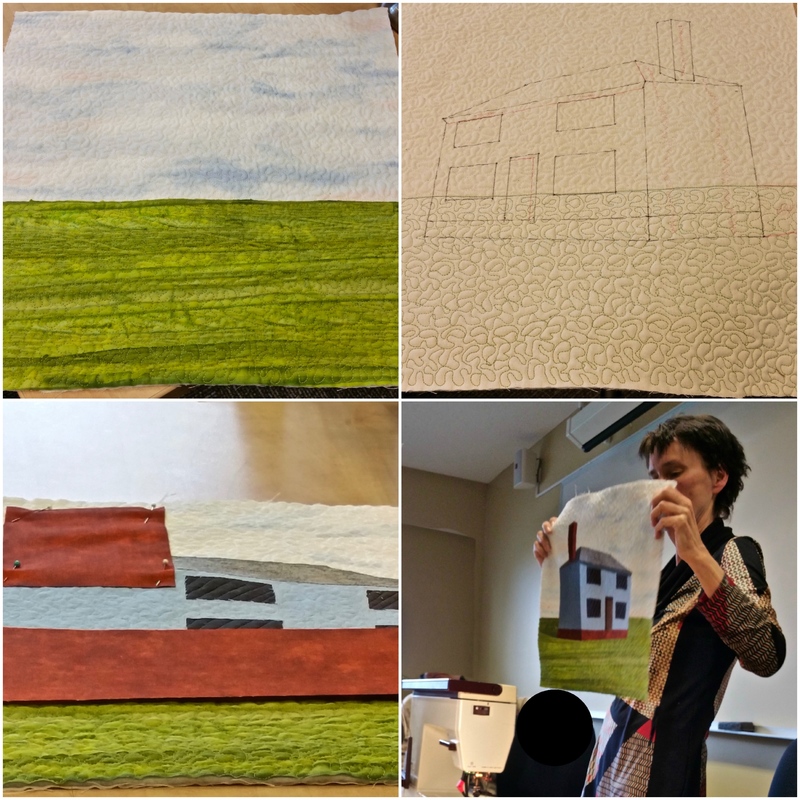 A couple of weeks ago I took a two-hour class with local fabric artist, Nancy Morgan. It was a fascinating two hours. She creates all of her pieces on a 40 year-old Pfaff sewing machine. It is not computerized as today’s machines are, and she has a second one that doesn’t work but from which her husband harvests parts to fix the first one. What does she love about this machine? It allows her to move from straight stitching to free motion without changing feet. That sure would be helpful. In my case, to switch from straight to free motion, I have to lift my machine out of the table to lower the feed dogs, and I need to get the screw driver out to remove the shank and foot. She brought several creations, all framed and under glass. In looking at them before class, I assumed she would share her favorite quilt shop for choosing fabric. Instead, she said she picks up most of her fabric at Joann Fabrics or Marden’s Surplus and Salvage in Maine. Marden’s makes Walmart look upscale, but it does have a huge cotton fabric department selection. Makes a sandwich of the front and back material with batting and free motion quilts the entire piece. She uses a very simple stippling method to quilt all of the pieces of the project. Draws the design on the back which is always a light muslin color so she can follow her drawing as she sews. Places material on the front, stitches from the back (3x around each section to keep from ravelling), free motion quilts (stipples) on the front, then trims excess material away with small, sharp scissors. She stitches, stipples, and trims each piece as she goes. In the class, she created a house with the front containing two pieces of material – blue for the sky and green for the grass. The green was put over the top of the blue. Then she did windows with black material, the house was blue, foundation and chimney in a burnt orange brick color, and finally the door in brown. Her last piece is using tulle (black or gray) as a shadow. Tulle was applied to certain areas (in this example – the left side of the house and under the eaves) to make the rest of it pop. Blue or white tulle is used when simulating water with fabric. She stitches around the tulle and then free motion quilts in large sweeping strokes instead of the smaller stippling used for the cotton fabric. Her fabric art pieces and her books are now going to be offered in her own store, Nancy Morgan Art, 238 State Street, Portsmouth, NH. The store will be open Thursday through Sunday, and she will be sewing there as well. If in Portsmouth, you might want to at least peek in the window. 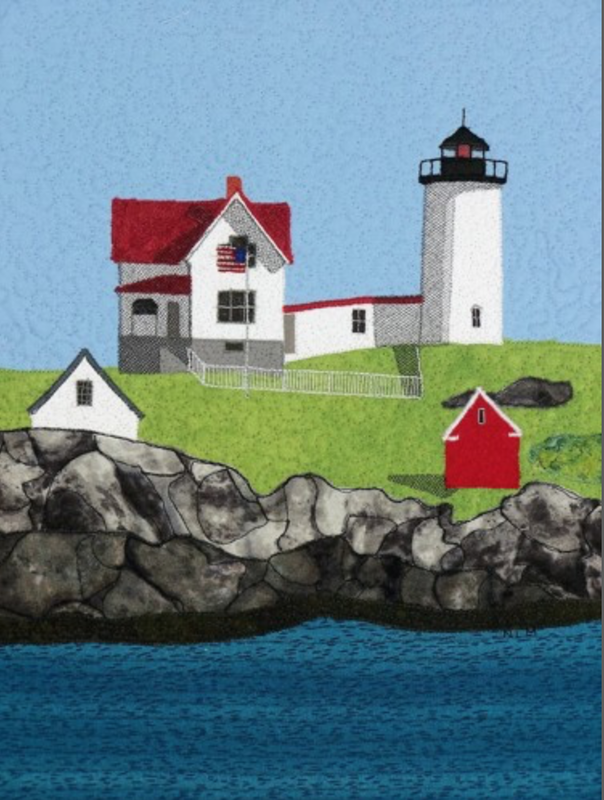 This entry was posted in New England, Quilting and tagged Fabric Artist, JoAnn Fabrics, Marden's, Nancy Morgan, Nancy Morgan Art, New England, Quilting, Sewing. Bookmark the permalink. Very impressive! Nancy is a true artist. I like seeing fabric design recognized as fine art. These landscapes manipulate both cotton and tulle into a feast for the eyes! Thanks for sharing her beautiful work with us. I’ve never been much of a seamstress although once upon a time I sewed some of my own clothes. These days whenever I get out my 50+ year old Singer sewing machine something goes wrong. Judy, I’ve had it since I was in high school. Never thought of selling it. It still worked for a little while the last time I used it and then started messing up. Fascinating! I love looking at art quilts, so very much, and it’s interesting to me that this is how Nancy goes about making her fabric art. The different texture with the sweeping motion vs stippling has a lot more dramatic effect than I would have guessed! The quiltiest quilter I know uses an old Singer, circa 1950 somethin for the free stitching as well. I don’t have enough dexterity or discipline (not sure which) to do that, so I admire it greatly. It’s incredible to view what an artist sees in a simple piece of cloth. Can’t wait to see what you come up with. Oh how fun something new to try! I can’t wait to see your finished, barn art. See, I told you I’d probably find it interesting, and I did 🙂 I just love to learn about the ways people figure out how to do things over time. I’m sure there is a lot of trial and error involved, but the current results are wonderful. My mother could create every kind of clothing. Knit. Crochet. Hook rugs. Paint. Make pottery. I write and take pictures, but otherwise? Nope. Mom never understood where I came from. Obviously NOT her. To see piece of fabric art in different stages from start to finish is amazing. Such a simple concept, such a unique finished product. Thanks so much for putting this together for us. Can’t wait to see yours!! And you’re selling yourself short when you say your sewing skills are “moderate “. Did you participate in the class or just watch as Nancy created? I’ll be interested to see your barn, Judy. One of my grandmothers was an excellent cook and the other was a wonderful seamstress and could sew anything. If she was alive now, she would probably have been a designer. I like to think I’ve inherited a little of each of their talents. Like you, I would need to be right at the front to see what the artist was doing. I learn best by seeing and following along. Don’t underestimate your abilities. I suspect you’ll be able to turn out a nice piece. This sounds like great fun and challenging. I ‘ll be looking forward to your barn portrait! It is amazing at what people create…so glad to have someone else’s work to look at! Love that you shared her process – so interesting. I think I would have trouble with the shading, as well. That’s very cool! Judy enjoys doing needlepoint. I don’t know where to start. At my bafflement that you consider your skills “moderate”? At my hooting at some of your readers’ comments and your “makes Walmart look upscale”? At my lifelong frustration that sewing genes in my ancestors were not passed down to me? It isn’t just the beauty of the fabric art that you’ve written about; it’s the marvelous breadth of talent there is in so many! Thanks! Marden’s is truly a really basic box store that sells very interesting products that have closed out somewhere. You can never go there with a shopping list just with an open mind. It has rows and rows of 100% cotton fabric that is used for quilting. It makes JoAnn’s selection look minuscule. They cut each piece of fabric and then staple a price to each piece. 🙂 I LOVE the comments too. I love it: shopping with an open mind instead of a list! I can do that! Fascinating. I wouldn’t have the skill or patience for this, but I anticipate that you will! If your weather is anything like ours today (CHILLY), it’s a good day for sewing. Can’t wait to see what you do. What an incredible artist!! Does she sell her finished work? Although I don’t sew, I will stop by and admire her new store on State Street. I’m in that neighborhood more than I should be because I drawn like a magnet to my favorite Byrne & Carlson Chocolatiers on the next block. This is so interesting Judy – the process of creating and how she does it, awesome results. I’m hoping that you show us what you do with fabric you find at Marden’s – this is really! Wow, she does absolutely amazing work. I can barely sew well enough to fix small holes along the seams of my clothes! This ain’t our grandmothers’ quilting! But I love it–both what Nancy does, specifically, and the broader lesson that rules need to be broken and rearranged sometimes. I hope you get started on your piece soon! I love fabric art, I dabbled a bit in it many years ago. Your post has made me think about trying it again. Your showing and explaining how to create these detailed quilts, using lessons from Nancy Morgan’s class was so generous and kind of you! It was fascinating and intricately done. I hand stitch many times in a year but sold my Mom’s old sewing machine and gave my DIL the portable sewing machine. I’m proud of her as she made all of Hendrix’s diaper pants and several little outfits. I used to like making “homemade” stockings but used store bought patterns with some felt on felt and some fabric on felt “patches” as well as beading. When my daughter gets her Christmas stuff unpacked, I’ll ask if I can get a photo of the few left that I made. 🙂 You are very talented already and this workshop will add another dimension to your beautiful handicraft.